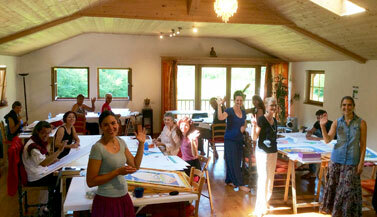 An overview of the upcoming thangka workshops. Click on the image or title to view all items per category. Where can I go for thangka classes? The classes are offered are different in subject, style and length, here you can read more about the different kinds of thangka workshops. This art is part of the Tibetan-Buddhist tradition. A thangka drawing or painting workshop always comes with a (short) meditation on the subject, as well as slide show & lecture(s) about the meanings and symbolism behind it. Most classes are suitable for both beginners and advanced. 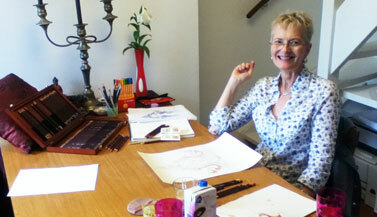 Carmen not only offers thangka drawing and painting courses, but is also asked to offer workshops in related artforms such as Tibetan Buddhist Amulet making and Tibetan Mask making. Several times a year (min. 1 / max. 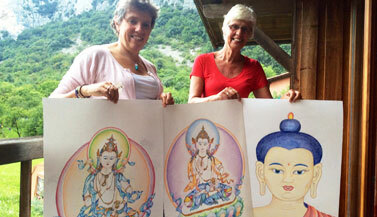 10 times) we send out a newsletter about the upcoming thangka classes and other Buddhist events. You can subscribe to the newsletter for one or more countries, so that you will be sure to stay updated on the thangka courses held at the place(s) of your preference. An example of the newsletter can be seen here on the right. Click on it to check out the different Newsletter Subscriptions. It goes without saying that we will not use your email address for anything else but this newsletter and that you can unsubscribe at any time. Receive the dates and subjects of upcoming Thangka Classes directly in your mailbox. Click here to see the different subscriptions.